Stockport Council's leader says a final decision will be taken next month on whether to continue with plans for a new bypass linking the A6 and the M60. It follows the publication of a draft report which sets out the business case for the £477m scheme, described as "very high" value for money. More than 4,500 people have signed a petition opposing the road, saying it would destroy the Goyt Valley. A final decision on funding will rest with the government. 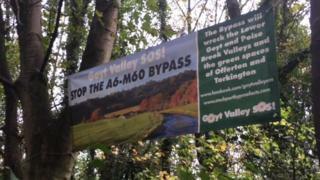 Council leader Alex Ganotis accepted the bypass would "seriously impact" the Goyt Valley. But he said more evidence was needed to understand the potential environmental impact and how much it would alleviate traffic in the Hazel Grove area before a decision could be taken. He said: "There is no final route decided, it's only an outline business case, but it does move the debate forward and yes, the council will need to formally decide how it wants to respond. "The point of this report is to start to provide us with the evidence we need to make that decision. "We absolutely need clarity about the extent to which this bypass would alleviate traffic issues along the A6 and the eastern part of Stockport." The proposed bypass would create a ring road around Stockport, which the report said could be open by the end of 2024. The report states the next step would be to carry out a more detailed assessment of what land would need to be acquired. Graham Trickey, from the campaign group Goyt Valley SOS, said the bypass would make congestion worse in the village of High Lane. "This is on top of congestion being made worse by the airport road that is currently being built," he added.